Would you like to increase the number of prepared students on your roster? Do you dream about a class students who, on day one, are informed and know what to expect from your class? Did you know there are more than 10,000,000 student comments shared on RateMyProfessors.com, a site your students use to learn about you and your class? Wouldn't you prefer to harness the potential of this web 2.0 wave to introduce yourself to your students and get them prepared for your class? 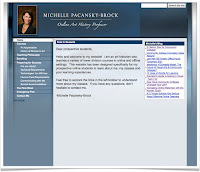 You will learn how to use an existing Professor Website Template on Google Sites to start building your site today! Join me this Wed, 10/13 at 12:00 PST for the @One Desktop Seminar: Increasing Student Success with Google Sites. Register here -- yes, it's free!